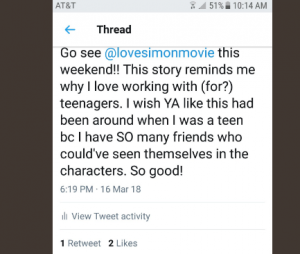 Earlier this week I shared my review of the movie Love, Simon, but I also wanted to share some thoughts I got from people via Twitter! The consensus is definitely that this movie is a hit. 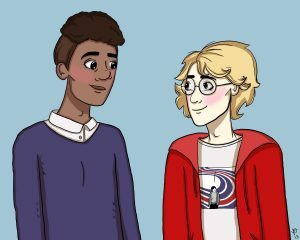 Now, this next part is a fan’s art based on the book/movie that she shared on Twitter. If you don’t know the story, then you might consider this a spoiler, so feel free to skip this next and final part! 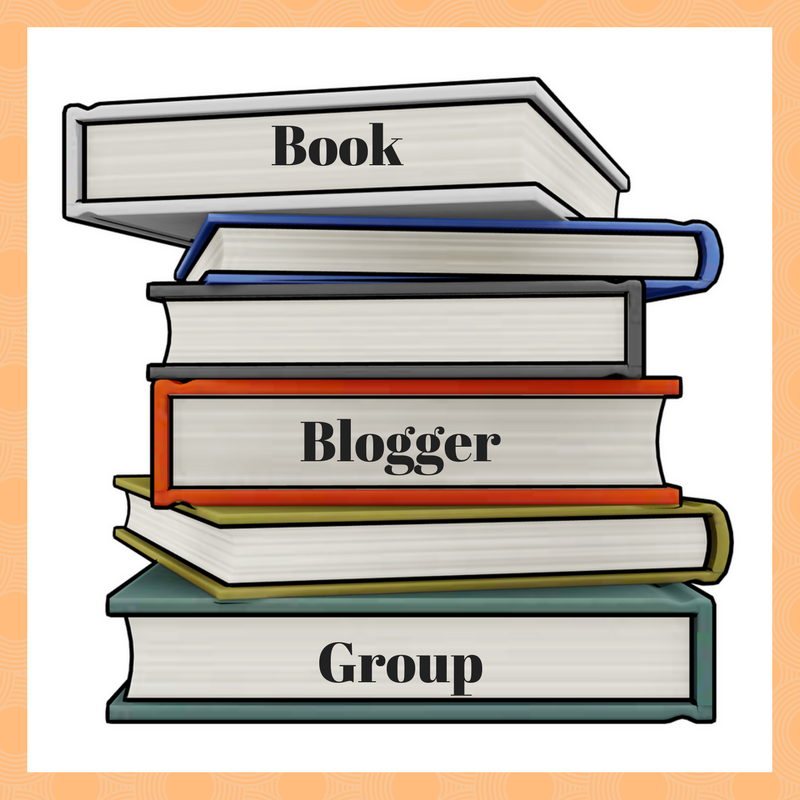 This artwork was created by Jamie from Becoming Bookish. I’m glad to see the movie is getting such a positive reaction. I still haven’t made it to the theater yet but hope to soon. thats awesome, glad they did such a great job on this and that it’s greeted with such positivity! I’ve heard such great things about this book, and movie! I need to read the book and then give the movie a go. It sounds so moving and also positive and funny. I really want to see this one. I’m glad to see it’s getting positive attention. I finally saw the film this weekend, and I liked it. There were a few interesting choices made, but overall, it DID capture the essence of the book and kept the spirit of Simon in tact. Aimee (Aimee, Always) recently posted: #BookstagramBoost: 5 Colorful Bookstagram Feeds to Feast Your Eyes On! Sounds like my kind of MOvie. Listed on my watch list. Thanks for your review. I have seen so many wonderful things about this movie! I seriously can’t wait to see it! I’ve been wanting to see this movie since I first saw a preview months ago. I can’t wait to watch it! I love seeing such positive feedback about the movie! Plus seeing celebs buying out entire screenings so viewers can go for free… love that! I’ve heard some great things about the movie, definitely makes me want to go see it. Looks like I really need to go see that movie! I think I’ll have to go see this one. The quotes were so interesting. Thanks. I hadn’t heard much about this movie but it sounds like a good one! I may have to check the movie out then. I was up in the air about it. I can’t wait to see this movie. I just saw Josh Dummel promoting it, and it looked really good. Maybe I’ll read the book first! oh thank you for sharing these Lauren! I’m happy to see it is making a positive impact on people, especially YAs! I know we still have a long way to go but it seems to be better now than then so it seems we are moving in the right direction. TAAAA DAAAAAAA Congrats! I’m going to need your email address Lauren! Ooh what? Did I guess right??? No worries at all – thank you so much! I will have to check this one when it releases on DVD. It looks wonderful. It’s nice to see reactions like this. 🙂 I love the one where the commenter says she wishes there was YA like that when she was younger. So true- we are so fortunate now. Aw, this is such a lovely post! I have honestly seen so many positive things about this movie that I get more excited for it with each passing day. It comes out tomorrow in Australia – finally!! But unfortunately I won’t be able to see it until the weekend, at the earliest. I don’t mind, though. Good things come to those who wait, right? Aw I am so glad that you- and others- loved it! I really need to see it- but I keep telling myself that I am going to read the book first. I have owned it since it first came out, Idk what my issue here is, because I have heard ALL the good things! I got to see this movie at an early preview and LOVED it! Such a good movie. I’m glad everyone seems to be enjoying it as well. I’ve heard so many great things about this! I definitely need to go out to see it. I am in for this movie! It sounds good and I love this post!